The Christmas tree at the Ala Moana Shopping Center in Honolulu. Planning to be in the Aloha State during Christmas and the New Year? 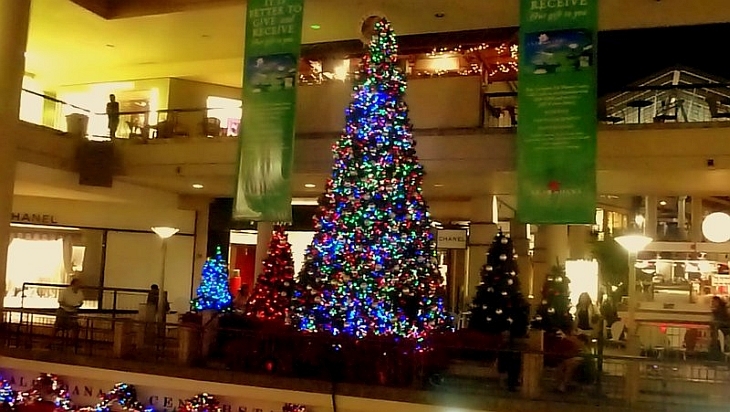 If so, here are some fun ways to celebrate the holidays in Hawaii. Whether you’re in a condo or hotel, decorate it with Christmas candles, mistletoe or wreaths. Take them to the next level with a little Christmas tree for the condo. String cranberries and native leaves for a table centerpiece. Make the season bright with a sparkling lights to bring cheer to your holiday vacation. Every island rings in the holiday season with festive parades and craft nights. They typically run from Thanksgiving Weekend until the New Year. On each island, the streets are merry with elves, singers, dancers and brilliantly lit Christmas trees. Wherever you’re vacationing, find the closest Christmas parade near you. And then enjoy a hot cup of cocoa with your family and friends in Hawaii. Everyone loves to sample Christmas cookies. So why not add Hawaiian flavors to the mix by adding macadamia nuts. If you are looking for creative ideas, attend one of the culinary tours for ideas on Christmas treats. Get the whole family to make a dish for Christmas dinner. Then add a Hawaiian dish to your traditional feast such as macadamia nut stuffing or lomi salmon. Instead of ham, make kalua pig the main course. Have a gingerbread house competition. Build grass shacks out of gingerbread for a spin on this classic Christmas tradition. Then use dried coconut, mango and a sprig of sugar cane to make palm trees to go with the gingerbread villages. Visit a local shop and find some note cards with paintings or prints of a Hawaiian artist. Then send out an authentic Hawaiian-designed Christmas card to your friends and family. You will be supporting creative local artists and your friends will have something special to share on their wall or table. If you’re on Molokai, you can send a coconut to anyone in the world through their Post-a-Nut service. That way everyone can enjoy a gift from the islands. Buy island-themed gifts for your friends and relatives back home. Whether they’re pearls, aloha shirts or Hawaiian jewelry, there are numerous shops to find that special Christmas gift. Instead of piling packages under the tree, why not give your family the gift of unforgettable memories? Treat your wife to a day of massage therapy at one of the elite Hawaiian spas. Take your family on a helicopter ride or on a cruise to see dolphins up close. You could even buy someone a surf lesson. Or fly over Hawaii Volcanoes National Park to see molten lava flows. There is an endless number of activities you can do when you celebrate the holidays in Hawaii.